In the remote Sierra Maestra mountains of Cuba, a team of filmmakers work on a documentary about life in Cuba. Their production includes a few Jeeps and a pack of mules. Once finished, the film will be saved onto a small external drive and sent out into the world. In a country where media is controlled by the government, this is the only means for distribution. But these challenges won’t stop this dedicated crew of visionaries from spreading their message. 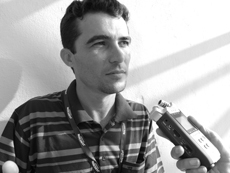 “We call what we do ‘communication for development.’ A great part of our work is telling the government what problems are there, what issues need attention,” said Carlos Rodríguez, a filmmaker with Television Serrana, a community media collective in Cuba. This month William & Mary welcomed Rodríguez to its campus. He visited the College in 2011, and returned this year to serve as the Swem Library Media Artist in Residence. Rodríguez has been a part of Television Serrana for 21 years. In that time, he has produced more than 500 short documentaries and trained dozens of young people from the Sierra Maestra mountains in video production so they can tell the stories of their communities and culture. The director of a series of award-winning documentaries, Rodríguez treats themes related to his surroundings. He believes that the role of a filmmaker is not only to entertain but also to empower and educate others. He is currently working on a more personal project about his parents, titled Rodriguez vs. Rodriguez. Before joining the Television Serrana, Rodríguez worked as a director for Cuban National Television and as a curator at the Provincial Center of Art. He has also served as a professor at the Cuban Institute of Cinematographic Arts and Industry. Rodríguez’s visit was arranged by Ann Marie Stock, a film and media studies professor at William & Mary, whose interest in Cuba spans over two decades. In 1989, Stock was studying Latin American cinema when she was encouraged to travel to Havana, Cuba, to attend a film festival there. That trip would have a lasting impact on her life. “My first trip to Havana was transformative for me both professionally and personally. It really changed my life,” she said. Since then Stock has visited Cuba over 50 times, conducting research and leading study trips for students and lifelong learners. Several years ago she partnered with Swem Library’s Media Services director Troy Davis to expand the program. Davis and Stock have traveled to Cuba to compile research material, created student assignments focused on Cuban film and brought Cuban filmmakers to W&M to teach and collaborate with students. While in residence during the month of April, Rodríguez will present his work to students in a variety of classes and to the greater community in a series of events. He will also collaborate with students and faculty working on audiovisual projects. He will return to Cuba later this month. His visit is made possible by Swem Library, Alma Mater Productions (AMP), Hispanic Studies and Film and Media Studies. On Thursday, April 17, there will be a public screening of Rodríguez’s work at 7 p.m. in Tucker Auditorium. Among the works to be shown are “Ruido en la senal/Static in the Signal,” “Tiempo de Cosecha/Harvest Time” and “Bohio/The Hut.” Rodríguez will introduce the program and be available for a Q&A after the screening. A reception will follow in the Tucker Foyer.